Analysis: With the playoffs out of reach, McCaffrey rested for most of Sunday as Cameron Artis-Payne and Travaris Cadet did most of the heavy lifting. The talented sophomore did warm up on the sidelines as a quarterback following Kyle Allen (shoulder's) injury, but the Panthers were able to grind the game away without his services. Though quiet Sunday, the dazzling back ended his season with 1,965 total yards and 13 total touchdowns. Analysis: McCaffrey was held out of Thursday's session in order to rest, but his presence on the field offers assurance he'll be good to go for the Panthers' Week 16 matchup with Atlanta. For the first time in his career, McCaffrey will have to adapt to a new quarterback, as Taylor Heinicke is set to fill in for the injured Cam Newton (shoulder) over the final two contests. McCaffrey rushed 16 times for 63 yards and two touchdowns while securing six of seven targets for 38 yards in Sunday's 26-20 loss to the Browns. Analysis: McCaffrey capped the opening drive with a four-yard rushing score and found pay dirt from one yard out in the first minute of the second quarter. He would have had a third short touchdown later in the game, but it was called back on a hold. 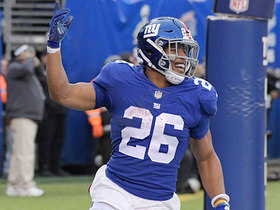 The versatile running back has found his scoring touch with 12 trips to the end zone over the past seven weeks, as compared to the measly one touchdown he scored in the first six games. Up next is a Monday Night Football date with the Saints in Week 15. McCaffrey carried 10 times for 106 yards Sunday against the Buccaneers. He also caught nine passes for 55 yards and a touchdown in the 24-17 loss. Analysis: McCaffrey wasn't used extensively as a rusher, but he still managed to go over 100 yards on the ground for the second straight game. He was also very productive as a pass catcher, leading the team in receptions while adding his sixth touchdown grab of the season. McCaffrey has averaged an outstanding 160.6 scrimmage yards per game over the last five, adding eight total touchdowns in that span. He'll enjoy another favorable matchup in Week 14 against the Browns. McCaffrey rushed 17 times for 125 yards and a touchdown while catching all 11 of his targets for another 112 yards and another score in Sunday's 30-27 loss to the Seahawks. He also fumbled three times but didn't lose any. McCaffrey rushed 13 times for 53 yards and brought in six of eight targets for 57 yards in the Panthers' 20-19 loss to the Lions on Sunday. Analysis: McCaffrey turned in another solid performance, although one that was more subdued than some of his recent efforts. He still drew even with D.J. 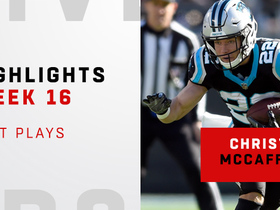 Moore for the team lead in targets and checked in second behind him in receptions, with McCaffrey's six catches qualifying as his best total in that category since Week 7. McCaffrey will undoubtedly be set for another high-usage assignment versus the Seahawks in Week 12. McCaffrey rushed 14 times for 77 yards and a touchdown and also brought in all five of his targets for 61 yards and two more scores in the Panthers' 52-21 loss to the Steelers on Thursday. He also recovered a Cam Newton fumble. McCaffrey rushed 17 times for 79 yards and two touchdowns and brought in five of six targets for 78 yards in the Panthers' 42-28 win over the Buccaneers on Sunday. McCaffrey rushed 14 times for 45 yards and a touchdown and hauled in four of his six targets for 11 yards and another score in Sunday's 36-21 win over the Ravens. McCaffrey carried seven times for 29 yards and gained 51 yards on six catches during Sunday's 21-17 win over the Eagles. McCaffrey managed only 20 rushing yards on eight attempts, but added seven receptions for 46 yards in a 23-17 loss to the Redskins on Sunday. McCaffrey carried 17 times for 58 yards Sunday against the Giants. He also caught five of six targets for an additional 35 yards and a touchdown in the 33-31 win. McCaffrey rushed 28 times for 184 yards and hauled in both of his targets for 10 more yards in Sunday's 31-21 win over the Bengals. Analysis: McCaffrey was surprisingly quiet as a receiver, but he made up for it with a huge game on the ground. He set up a first-quarter Cam Newton touchdown with a career-long, 45-yard run. Newton's prowess as a short-yardage rusher (he scored two in this one), limits McCaffrey's scoring upside, but the second-year running back is a threat to pick up massive chunks of yardage in all situations. He'll have a chance to rest up after this heavy rushing workload with a bye next week. 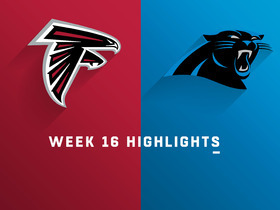 McCaffrey rushed eight times for 37 yards and brought in 14 of 15 targets for 102 yards in the Panthers' 31-24 loss to the Falcons on Sunday. McCaffrey carried 10 times for 50 yards and caught six of nine targets for 45 yards during Sunday's 16-8 win over the Cowboys. McCaffrey rushed 12 times for 48 yards and caught both his targets for 16 yards in Friday's 25-14 win over the Patriots in the third preseason game. Analysis: McCaffrey was plenty busy while playing the entire first half, as he also recovered a fumble by quarterback Cam Newton. Besides that, he was featured in a variety of ways, including four carries from inside the 10-yard line on Carolina's opening drive. Clearly looking like the team's backfield workhorse this season, McCaffrey's increased volume should boost his upside as he gets more opportunities to display his big-play ability in his second year. McCaffrey had five carries for 92 yards and a touchdown along with four catches for 28 yards on five targets in Friday's preseason game against the Dolphins. McCaffrey (illness) rejoined the Panthers for practice Monday, Jourdan Rodrigue of The Charlotte Observer reports. Analysis: After sitting out Sunday's session with the ailment, McCaffrey was back on the field a day later donning full pads, indicating that he'll face no limitations heading into Thursday's preseason opener in Buffalo. It's expected that McCaffrey will only play a series or two in the first exhibition game as head coach Ron Rivera uses that contest to evaluate some of the more fringy roster candidates. McCaffrey is not participating in Sunday's practice due to an illness, Jourdan Rodrigue of the Charlotte Observer reports. Analysis: McCaffrey doesn't appear to be dealing with anything serious that could keep him out of practice for an extended period of time, but the Panthers won't force the issue at this time of year. The second-year running back is expected to see an increase in touches this season after racking up 117 carries and 80 catches as a rookie in 2017, so Carolina's offense needs McCaffrey as healthy as possible for Week 1 and beyond. 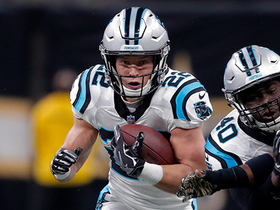 McCaffrey would get between 25 to 30 touches per game in Panthers coach Ron Rivera's ideal scenario this season, David Newton of ESPN.com reports. McCaffrey reported to training camp Wednesday at 208 pounds, Joe Person of The Charlotte Observer reports. 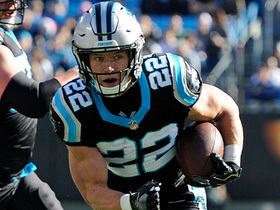 Panthers coach Ron Rivera won't be surprised if McCaffrey reaches 200 carries this season, ESPN.com's David Newton reports. McCaffrey likely will have a new backfield partner in 2018, though he could see more touches as a result of Jonathan Stewart's recent release, Max Henson of the Panthers' official website reports. "I think you do need to have that in the NFL today," Panthers head coach Ron Rivera said Thursday at the NFL Scouting Combine. "It's tough to have one guy that just dominates a game. You have to have guys that have similar characteristics but also do something special that can separate them." McCaffrey finished with six rushes for 16 yards and caught six of eight targets for 101 yards and a touchdown in Sunday's 31-26 NFC wild-card loss to the Saints. McCaffrey rushed six times for 14 yards and brought in five of eight targets for 40 yards in Sunday's 22-10 loss to the Falcons. McCaffrey is in line to serve as the lead back for the Panthers, as fellow running back Jonathan Stewart is inactive for the game due to back tightness. Analysis: McCaffrey is typically the lead back in Carolina, but has conceded anywhere from 20 to 30 snaps to Stewart in every game since the Week 11 bye. With a NFC South title on the line Sunday, McCaffrey will now presumably get to showcase his skill set as the feature back. Though Cameron Artis-Payne and Fozzy Whittaker are waiting in the wings, McCaffrey is the most dynamic of the three, and should be given every opportunity to build upon his effort of 39 rushing yards in Week 16. McCaffrey rushed nine times for 39 yards and caught two of four targets for 19 yards in Sunday's 22-19 win over the Buccaneers. Analysis: McCaffrey and Carolina's offense as a whole struggled to get much going Sunday, but the rookie was once again handed more carries than starting tailback Jonathan Stewart. While that usage is reason for encouragement heading into next Sunday's finale versus the Falcons, so too is the fact that McCaffrey's season-high rushing output came against Atlanta in Week 9. In that game, he finished with 66 yards and a touchdown on 15 carries and 28 receiving yards on five receptions. McCaffrey rushed 12 times for 63 yards and caught six of seven targets for 73 yards and a touchdown in Sunday's 31-24 win over the Packers. McCaffrey rushed eight times for 35 yards and caught three of four targets for 18 yards in Sunday's 31-24 win over the Vikings. Analysis: McCaffrey entered Sunday's contest with good momentum, but a couple of factors combined to contribute toward his Week 14 dip. Not only was the rookie going against Minnesota's exceptional defense, but veteran Jonathan Stewart's 103-yard, three-touchdown performance meant he wasn't needed as much as usual. Fortunately for McCaffrey, a bounce-back outing could be in store, as an inferior Packers defense visits Carolina next Sunday. McCaffrey took six carries for 16 yards and caught five of six targets for 33 yards and a touchdown in Sunday's 31-21 loss to the Saints. Analysis: While unable to build on his rushing success from the previous three contests, McCaffrey was left wide open in the flats for a 21-yard touchdown en route to finishing second on the team in targets. There wasn't much volume to go around, as the Saints used their phenomenal running game to dominate possession. McCaffrey should have a better chance to pile up touches in Week 14, though efficiency is always a tough task against the Minnesota defense. McCaffrey (shoulder) is listed as active Sunday in New Orleans, Jourdan Rodrigue of The Charlotte Observer reports. Analysis: McCaffrey began the week with an absence from practice, but limited sessions Thursday and Friday left head coach Ron Rivera feeling optimistic about the rookie's availability. With his status confirmed Sunday, McCaffrey will suit up against a Saints defense that has allowed 138.4 yards from scrimmage per game and six touchdowns to running backs in 11 outings this season. McCaffrey (shoulder), who is listed as questionable for Sunday's game against the Saints, is expected to play, Adam Schefter of ESPN reports. 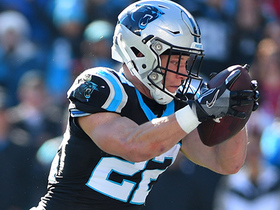 McCaffrey (shoulder) is listed as questionable for Sunday's game in New Orleans, with head coach Ron Rivera optimistic the running back will play, Joe Person of The Charlotte Observer reports. Panthers coach Ron Rivera said the team may wait until Saturday to make a decision on whether McCaffrey (shoulder) plays in Sunday's game against the Saints, David Newton of ESPN.com reports. Analysis: While the final injury report hasn't been released, Rivera's comments all but assure McCaffrey will be listed as questionable. The running back returned to practice Thursday as a limited participant, and he's back on the field Friday in some capacity. Another update will be available when the injury report is released. McCaffrey (shoulder) turned in a limited practice Thursday, Jourdan Rodrigue of The Charlotte Observer reports. Analysis: Present and in pads at the start of the session, McCaffrey appeared to go through all drills during the open portion, per Joe Person of The Charlotte Observer. That said, McCaffrey must have had some limitations in his first visible activity of the week. Afterward, he told Rodrigue that his shoulder "feels good" in advance of Sunday's game at New Orleans, so he's a decent bet to ditch his designation by week's end. McCaffrey (shoulder) was donning shoulder pads for the start of Thursday's practice, David Newton of ESPN.com reports. Analysis: After being listed as a non-participant for the Panthers' first session of the week with a shoulder issue, McCaffrey looks bound to take the field in some capacity Thursday. The Panthers will issue a formal update on McCaffrey's participation level once Thursday's session concludes, but no matter how he's listed, the expectation remains that the rookie running back will be ready to go for Sunday's game against the Saints. McCaffrey was unable to practice Wednesday due to a shoulder injury, Max Henson of the Panthers' official site reports. Analysis: The release of the Panthers' first Week 13 injury report revealed McCaffrey's ailment, which stems from Sunday's win versus the Jets. Head coach Ron Rivera told Joe Person of The Charlotte Observer that McCaffrey received "a hit" in the game and, speaking of his status, said, "We'll see tomorrow." While McCaffrey doesn't necessarily need to make an appearance at practice Thursday, he may need to show a degree of progress with the training staff. McCaffrey ran for 62 yards on seven carries and added 35 yards on two catches in Sunday's 35-27 win over the Jets. 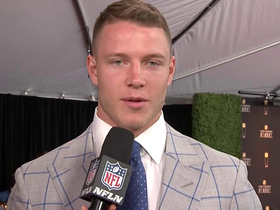 McCaffrey took increased snaps as a slot receiver in the Panthers' practices this week and could see more use in that role Sunday against the Jets, Ian Rapoport of NFL Network reports. McCaffrey rushed five times for 23 yards and a touchdown in Monday night's 45-21 win over the Dolphins. He also caught three of seven targets for 27 yards and another score. 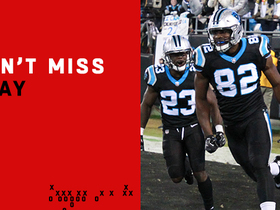 Analysis: McCaffrey was efficient with his touches on a night when top tailback Jonathan Stewart went for 110 yards on 17 carries. Not only did McCaffrey take a zone-read handoff four yards for Carolina's opening touchdown, but he piled on with a two-yard touchdown grab along the sideline during the third quarter. In doing so, the rookie has now scored five times over the past six games, sending him into the Panthers' bye week full of confidence. McCaffrey rushed 15 times for 66 yards and a touchdown in Sunday's 20-17 win over the Falcons. He also caught five of six targets for 28 yards. 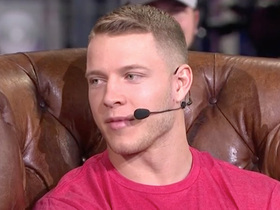 Carolina Panthers running back Christian McCaffrey joins the "Good Morning Football" crew to discuss his 2018 season. 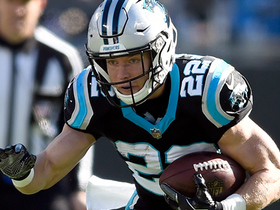 Watch the best plays from Carolina Panthers running back Christian McCaffrey's 101-yard day against the Atlanta Falcons. 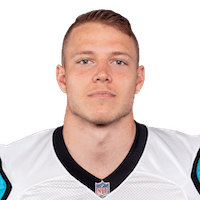 Carolina Panthers Christian McCaffrey breaks an NFL record for most RB catches for a season, catching his 103rd of the season. Carolina Panthers running back Christian McCaffrey reaches his 1,000-yard mark for rushing with an 8-yard carry against the Atlanta Falcons.